Your desktop computer or laptop can fail and become unusable at any time. When this happens, most users are left wondering whether or not it is possible to transfer Files and Photos from dead computer to new one. As long as the hard drive in the dead laptop is still working and it is not damaged or severely corrupted, it is possible to transfer Files and Photos from dead computer to a new one. In our case, an older Windows Laptop had suffered motherboard failure and getting it repaired was going to be expensive. Hence, it made more sense to replace the Laptop with a new one and simply transfer files and photos from dead computer to a new one. 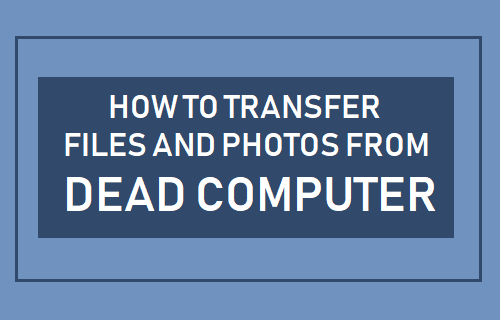 If you are dealing with a similar situation, you can follow the steps as provided below to transfer files and Photos from dead computer to a new one. The first step is to pull out the Hard Drive from the dead computer and find its type and size. Laptops usually have 2.5″ Hard drives while desktops have 3.5″ size Hard drives. In case of a Laptop, you should be able to access the Hard drive by removing the plastic cover from the hard drive bay. Once the hard drive is accessible, remove tiny screws holding the hard drive in place, remove the connector cable and pull out the hard drive. After removing the Hard Drive, note down its size and type of Hard drive. Newer Laptops have 2.5″ SATA Hard Drives with flat connectors, while older Laptops have 2.5″ PATA hard drives with PIN Connectors. The next step is to buy a USB Adapter matching the size and type of Hard Drive that you removed from your dead computer. You can either buy an inexpensive SATA to USB Adapter from a local tech store in your area or buy from an online source. 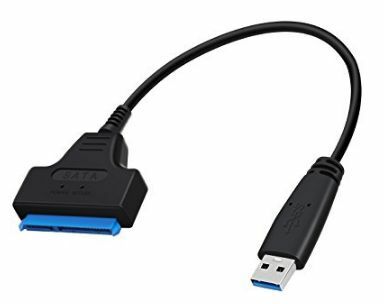 To get started, you can take a look at this USB 3.0 to SATA Adapter for 2.5~3.5 inch hard drives as available at Amazon. If this does not match, search using the term “SATA to USB Adapter” and you will find many inexpensive adapters. The final step is to connect the old hard drive to the USB port of the new computer and transfer files and Photos to the new computer. 1. Plug the SATA end of the Hard Drive into the USB Adapter and plug the USB end into the USB port of your new laptop. 2. Open File Explorer on your new laptop and you should be able to see your old hard drive connected as an external hard drive. 3. Double-click on the icon representing the Old hard drive and navigate to the Folders containing your Files and Photos. 4. Simply, copy the Folders containing Files and Photos from the old Hard Drive and Paste them to the Hard drive of your new Laptop. In case you believe that the old hard drive is still good enough and reliable, you can use it as an external hard drive or as a backup drive for your computer.